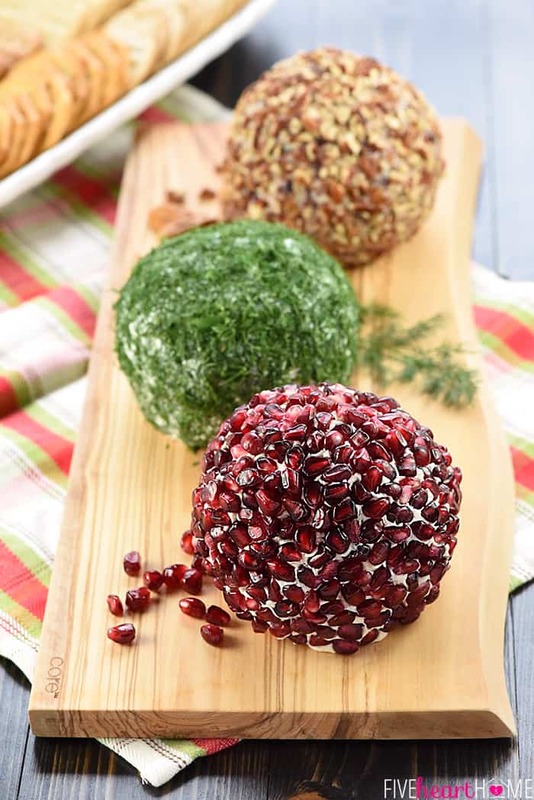 Christmas Ornament Cheese Balls are a fun, festive addition to your holiday party menu in three mouthwatering flavors — Cranberry, Blue Cheese, & Pecan; Garlic, Feta, & Dill; and White Cheddar, Rosemary, & Pomegranate! It’s beginning to look (and feel) a lot like Christmas! Last night marked our first freeze of the season. The house is decorated and the Christmas cards have been mailed. We’ve been drinking egg nog like it’s going out of style. And this weekend, I’m looking forward to a mommy-daughter date to take my 4-year-old to the Nutcracker for the first time! 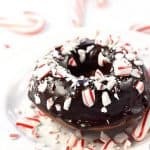 So it only makes sense that today’s recipe should be extra festive and Christmas-y, right? But let’s not stop there. These aren’t you’re ordinary cheese balls, folks. 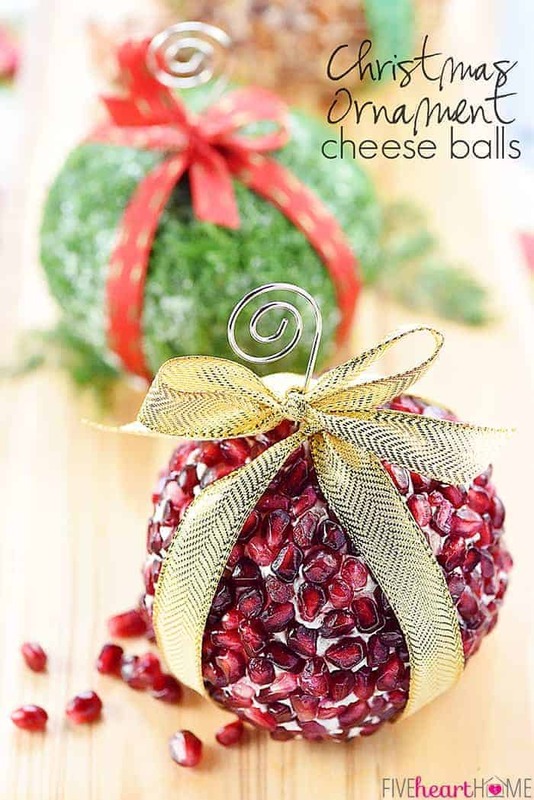 These are cheese balls masquerading as Christmas ornaments! Because why shouldn’t party food double as decor? First, I had to devise the cheese ball recipes themselves. 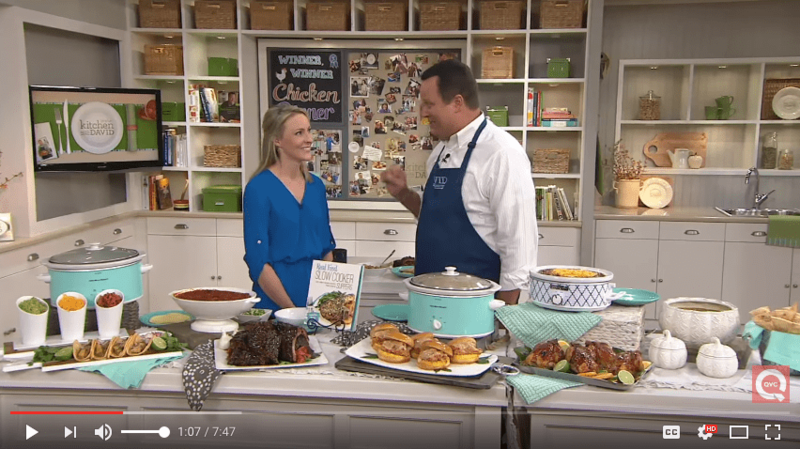 All of them started with a block of cream cheese, but then it was time to have some fun with flavor and texture! The first one was easy, because it was patterned after those aforementioned Mini Cheese Ball Bites. For the Cranberry, Blue Cheese, & Pecan Cheese Ball, I whipped crumbled blue cheese and a generous amount of chopped dried cranberries into a softened block of cream cheese. The plentiful cranberries help counter the robust flavor of the blue cheese so that it’s not too strong or overwhelming in the final cheese ball. 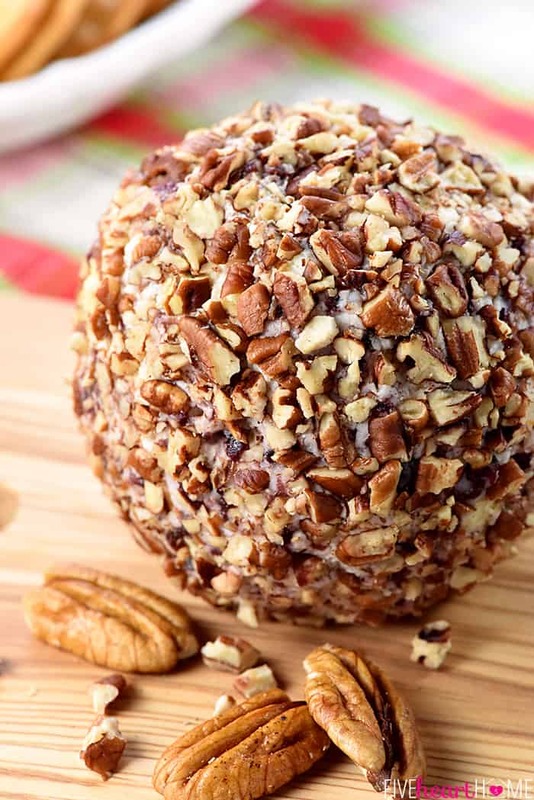 After the cheese ball chilled until firm, I pressed toasted pecans into its surface for nutty flavor and wonderful crunch. Next I decided to channel a Mediterranean vibe with a Garlic, Feta, & Dill Cheese Ball, inspired by an amazing garlicky whipped cheese spread that I enjoyed recently. That spread was sprinkled with dill and I haven’t been able to stop thinking about it since, so like any good food blogger, I was determined to recreate it. 😉 I added feta to make it more substantial in cheese ball form, but even so, this was the softest cheese ball of the bunch. No complaints, though, as the flavor is fantastic. 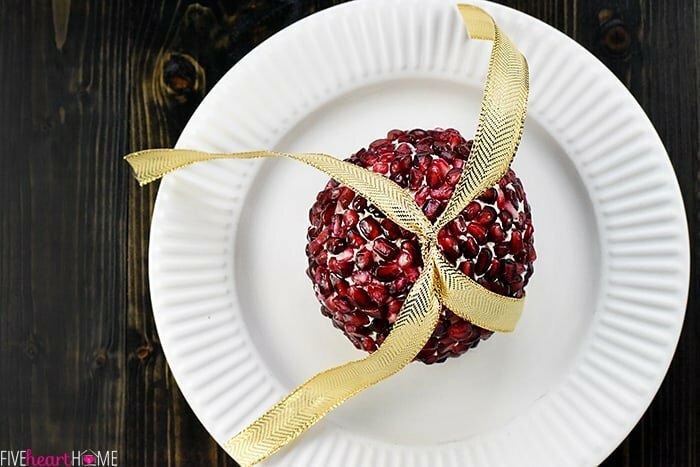 For my final White Cheddar, Rosemary, & Pomegranate Cheese Ball, I wanted a more neutral filling in order to let the exterior really shine (both literally and figuratively)…a shimmery mantle of ruby red pomegranate jewels! Aren’t they purty? So I kept the cream cheese enhancements simple for this one with some sharp white cheddar, a splash of Worcestershire sauce, and a touch of fresh minced rosemary. Now these cheese balls would be perfectly lovely to serve as-is. Everyone would be thrilled to dig in and nobody would ever know the difference! 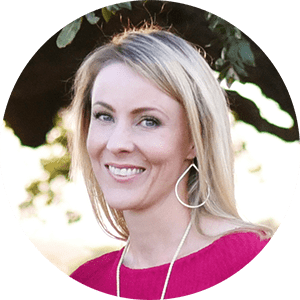 But should you feel motivated to kick things up a notch, it’s simple to turn these traditional appetizers into fancy Christmas Ornament Cheese Balls! …and then tie one around the other so that they do indeed make an X. 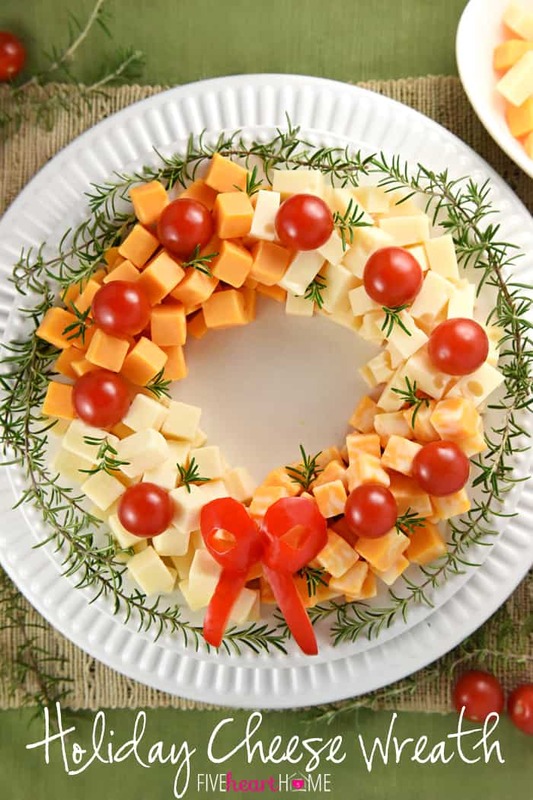 …and then tuck the pieces under the bottom so that the ribbon is tight against the cheese ball. 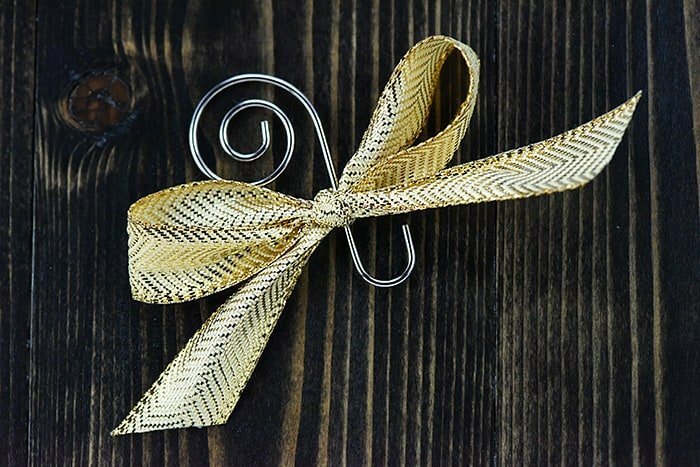 Cut another length of ribbon and tie it in a bow around an ornament hanger. Then stick the bottom of the ornament hanger into the top center of the cheese ball, right where the ribbon X crosses. Push the bow down so that it’s sitting right on top of the cheese ball. And TA-DAAAAAAA! 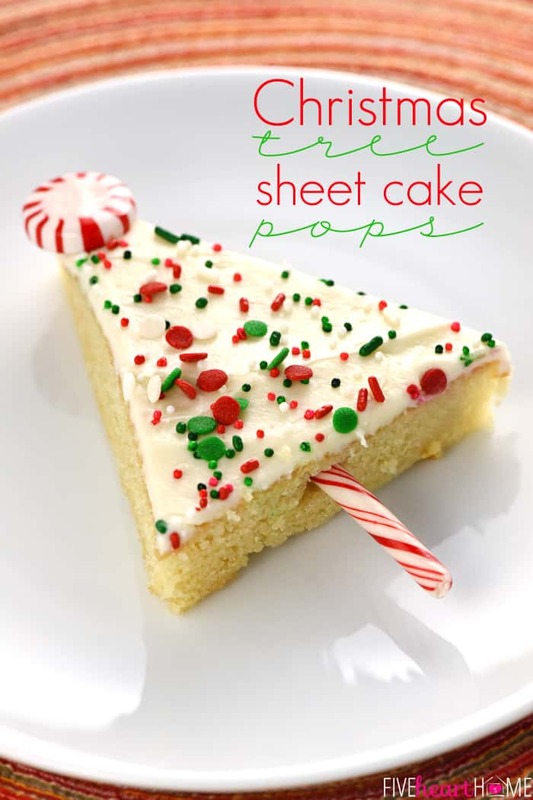 Fun, festive, and oh-so-cute. Did I mention tasty, too? These Christmas Ornament Cheese Balls are truly a perfect appetizer for all of your holiday entertaining needs. 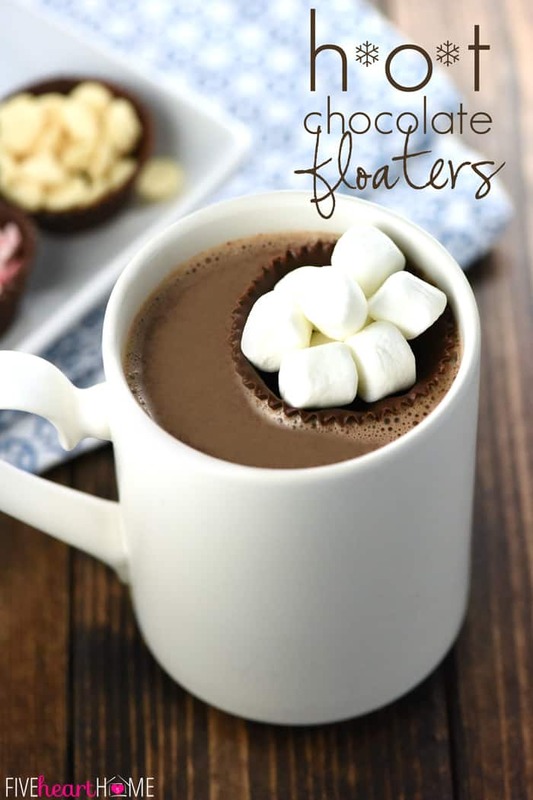 Furthermore, they’re delicious enough to serve at parties or get-togethers any time of year…minus the ribbon and wire hanger, of course. 😉 Enjoy, friends, and stay warm this weekend! 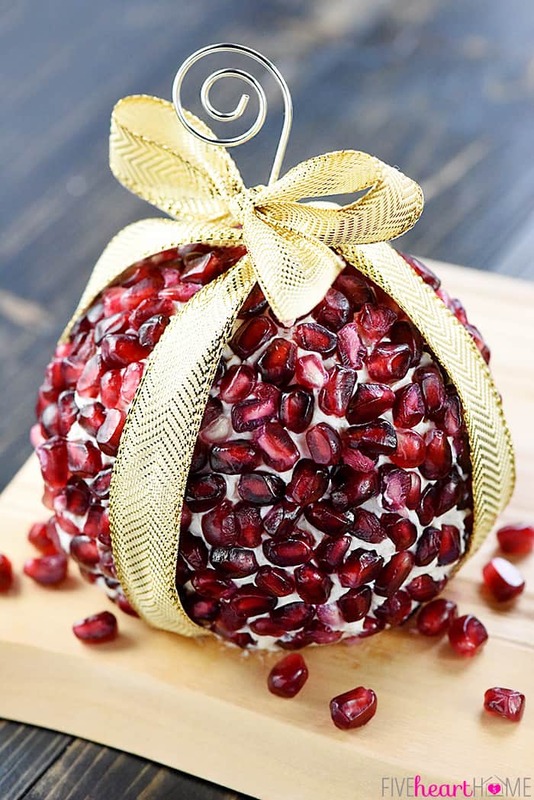 Christmas Ornament Cheese Balls are a fun, festive addition to your holiday party menu in three mouthwatering flavors -- Cranberry, Blue Cheese, & Pecan; Garlic, Feta, & Dill; and White Cheddar, Rosemary, & Pomegranate! 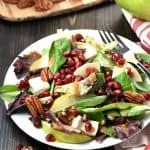 For the Cranberry, Blue Cheese, & Pecan Cheese Ball, use an electric mixer to beat together the cream cheese, blue cheese, and dried cranberries until smooth. Scrape the mixture onto the center of a large piece of plastic wrap. Fold the plastic wrap over the mixture and carefully shape it into a ball. Refrigerate for at least 8 hours, or overnight. For the Garlic, Feta, & Dill Cheese Ball, use an electric mixer to beat together the cream cheese, feta, garlic, lemon juice, 1 tablespoon dill, and black pepper until smooth. Scrape the mixture onto the center of a large piece of plastic wrap. Fold the plastic wrap over the mixture and carefully shape it into a ball. 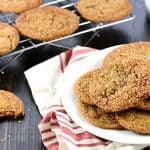 Refrigerate for at least 8 hours, or overnight. 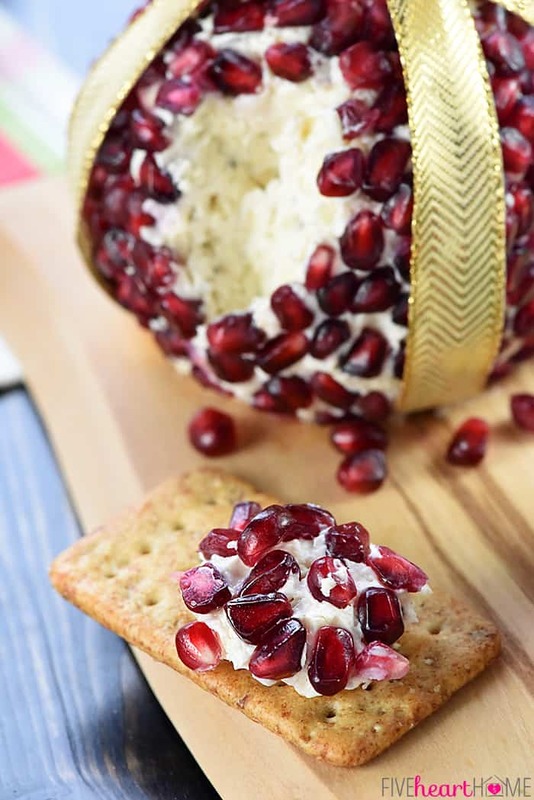 For the White Cheddar, Rosemary, & Pomegranate Cheese Ball, use an electric mixer to beat together the cream cheese, grated white cheddar, Worcestershire sauce, garlic salt, and rosemary until smooth. Scrape the mixture onto the center of a large piece of plastic wrap. Fold the plastic wrap over the mixture and carefully shape it into a ball. 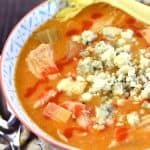 Refrigerate for at least 8 hours, or overnight. The cheese ball coatings may be prepared ahead of time or just before assembling the cheese balls. Toast the pecans by spreading them out on a sheet pan and baking in a preheated 350°F oven until lightly toasted and fragrant, for 8 to 10 minutes. Allow pecans to cool and finely chop them. 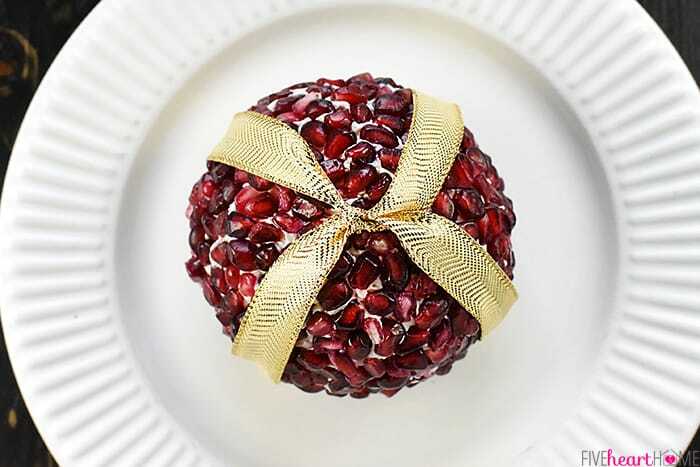 Seed the pomegranate (see Tips & Tricks below) and set aside. Finely mince 1/4 cup fresh dill (make sure it's washed and very well dried) and refrigerate in a baggie until ready to use. Pour the toasted, chopped pecans into a shalllow bowl. Press the cranberry/blue cheese cheese ball into the pecans so that it's covered on all sides (the bottom doesn't matter). 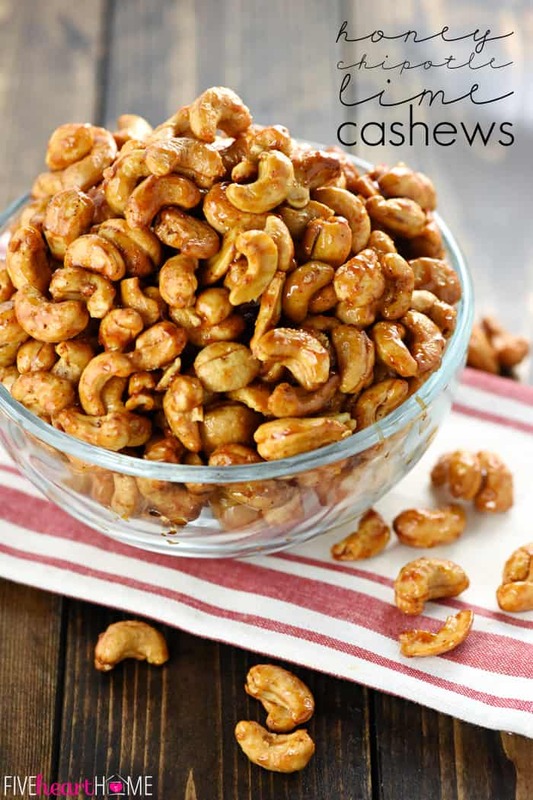 Use your hands to press additional pecans into any bare spots. Wash and dry your hands and gently reshape the cheese ball into a sphere, if necessary. Pour the minced dill into another shallow bowl. Press the garlic/feta cheese ball into the dill so that it's covered on all sides (the bottom doesn't matter). 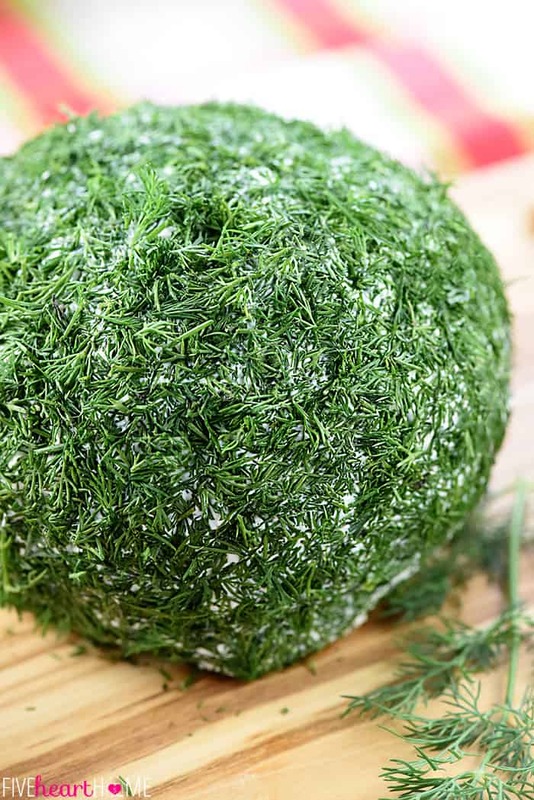 Use your hands to press additional dill into any bare spots. Wash and dry your hands and gently reshape the cheese ball into a sphere, if necessary. 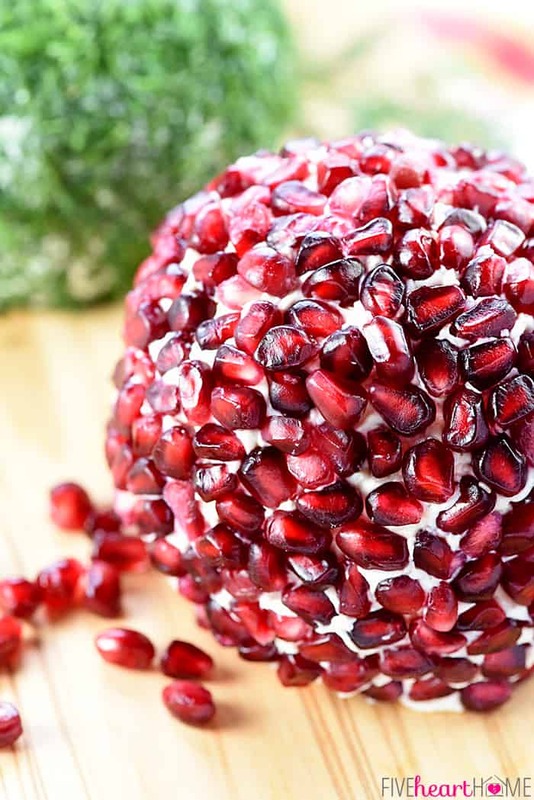 For the white cheddar/rosemary cheese ball, carefully press the pomegranate seeds into the surface of the cheese ball, leaving no gaps and placing them individually with your fingers as needed. For each cheese ball, cut two pieces of ribbon that are long enough to lay over the top of the cheese ball and tuck under its bottom. 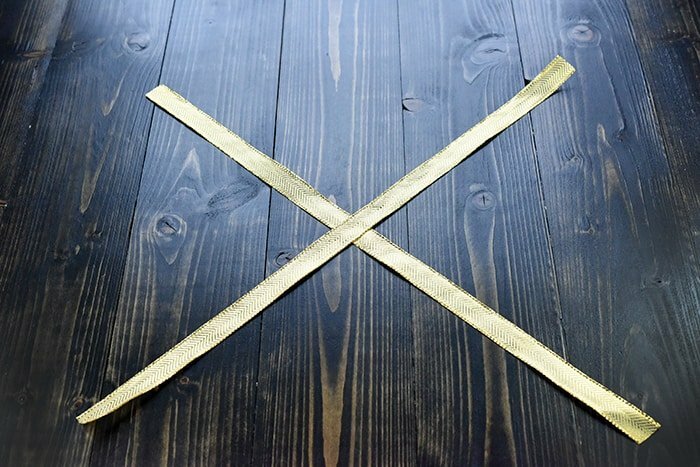 Cross them like an X and then tie one ribbon around the other so that they make an X (see photos above the recipe). Lay the X on top of the cheese ball so that the four ribbons hanging down evenly divide the cheese ball into fourths and then tuck the pieces under the bottom so that the ribbon is tight against the cheese ball. 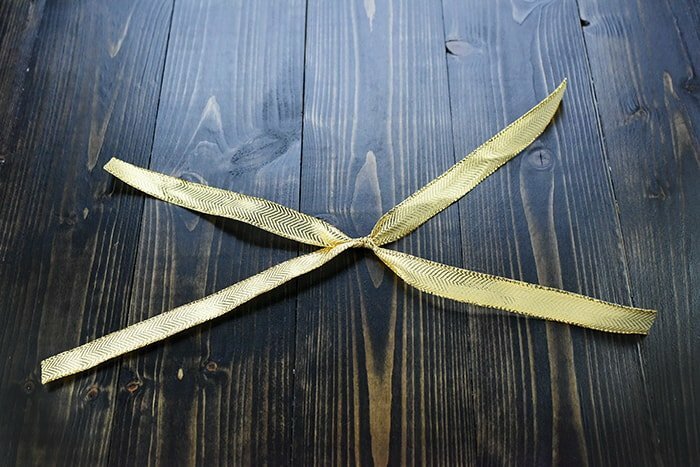 Cut another length of ribbon and tie it in a bow around an ornament hanger. Then stick the bottom of the ornament hanger into the top center of the cheese ball, right where the ribbon X crosses. Push the bow down so that it's sitting right on top of the cheese ball. 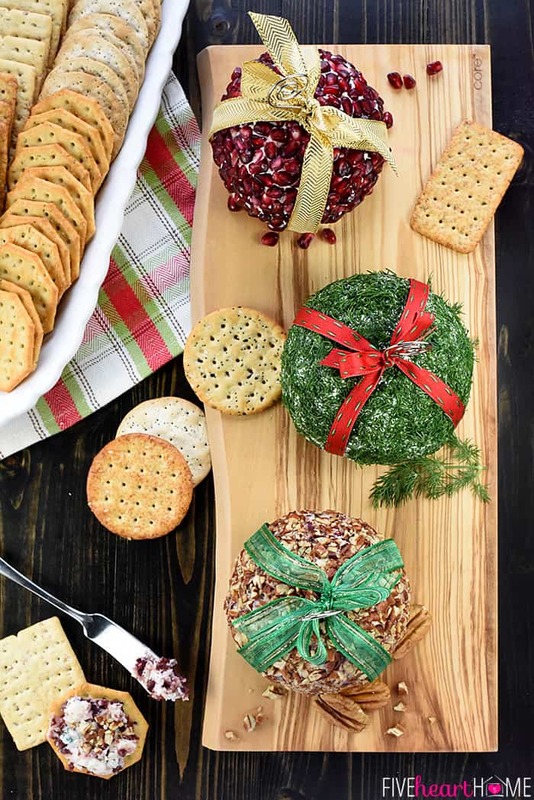 While you are working on coating and decorating each cheese ball, it's a good idea to keep the other cheese balls refrigerated so that they don't soften too much. The bases of the cheese balls may be made up to a couple of days in advance. However, the decorated cheese balls are best finished shortly before serving them. 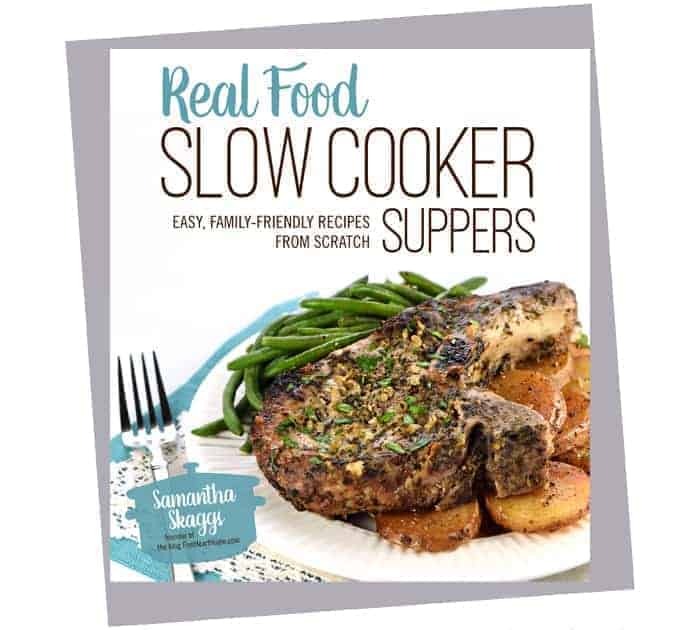 You may make them slightly ahead of time and then chill them again until ready to serve, but if you make them too far ahead of time, the pecans may get soggy, the pomegranate seeds may bleed, and the dill may start to darken or brown.